It may be the most spectacular art object in London this year, but what is Christo’s London Mastaba about? How does this extraordinary object, a 20m-high, 30m-wide and 40m-long installation made of 7,506 bright painted barrels that’s floating in the Serpentine, fit into modern and contemporary art, and what is its backstory? 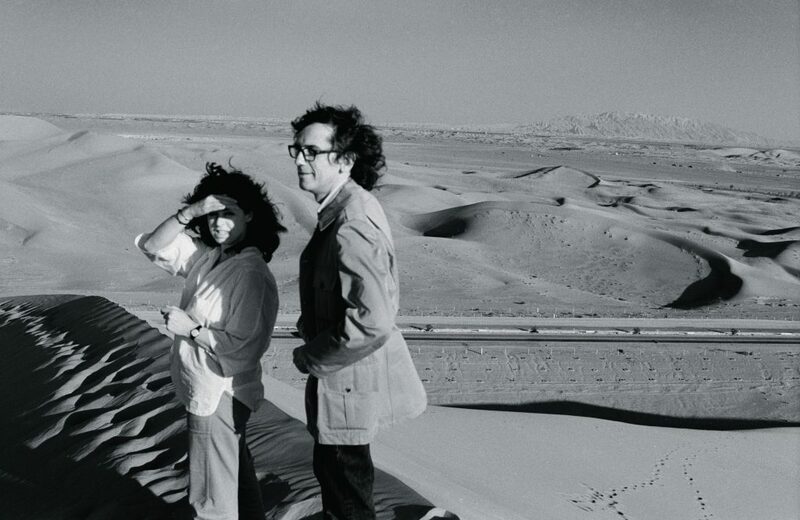 The Serpentine Gallery rolls out a backstory about his barrels that goes all the way back to 1958, with a feast of models and drawings in a parallel show, Christo and Jeanne-Claude: Barrels and the Mastaba. Maybe you thought Christo was just about wrapping big things, like 2.5km of Australian cliffs in Wrapped Coast (1969) or Berlin’s Reichstag (1995), or even other temporary blockbuster works involving vast quantities of cloth or textile such as The Gates (2005) in Central Park, New York and The Floating Piers (2016) at Lake Brescia, Italy. The Serpentine shows take a double-barrelled shotgun blast at that — Christo does barrels too. And they go back at least as far as the wraps. Christo is a defector from Stalin’s communist bloc. He escaped Bulgaria in 1956 by bribing a customs official to stow away on a train from Czechoslovakia to Vienna, and settled in Paris in 1958. That year, he met his late wife Jeanne-Claude, and also showed his first sculptures of found cylindrical containers, including the piled-up Wrapped Cans series and Wrapped Oil Barrels. But Evgenia Atanassova, a Bulgarian writer, film-maker and Christo expert, says he engaged with barrels even earlier — at his father’s Bulgarian chemical factory. He trained as a painter at the Sofia Academy, and he told her that there, ’I wanted to move away from ordinary paintings and make real things’. Do Christo’s barrels make political statements? Initially yes, but not necessarily what everyone expected. 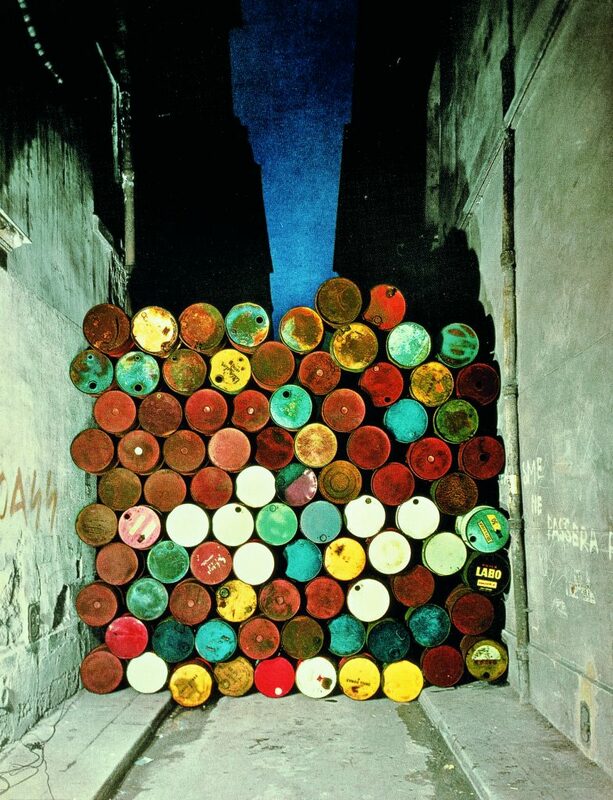 In 1962, Christo piled up a wall of barrels across rue Visconti in Paris, and there’s great photos of it at the Serpentine show. The work lasted two hours before the police came and told him to take it down. Many saw it as a statement about France’s Algerian war at the time, and it could even be a reference to the street barricades of the revolutionary Paris Communes of 1871. Neither are the case — the title of the work was Wall of Barrels – The Iron Curtain, responding to the Berlin Wall erected a year earlier. But then any politics seems to disappear. The biggest barrel project of all — like many, unrealised but drawn and modelled in detail — is the Mastaba for Abu Dhabi (1977), which would be around 150m high and need 410,000 barrels. Barrels carry oil, Abu Dhabi produces it, and the Oil Crisis had sent shockwaves through the 1970s global economy, but Serpentine curator Melissa Blanchflower says that the Abu Dhabi project has no political agenda. Indeed, Christo told Serpentine artistic director Hans Ulbricht Obrist that he ‘refutes artists who claim to talk about politics’. He says he deals with the real politics of getting permission to stage his works. Must we accept that it is just coincidence that Christo’s Abu Dhabi project and the real politics of the Middle East, inseparable from oil whatever its regional rivalries and fundamentalist resurgences, both come down to barrels? Christo’s barrels have changed, from the found drums of earlier works with their rust, faded paint and scratches to the shiny, painted ones of the mastabas. 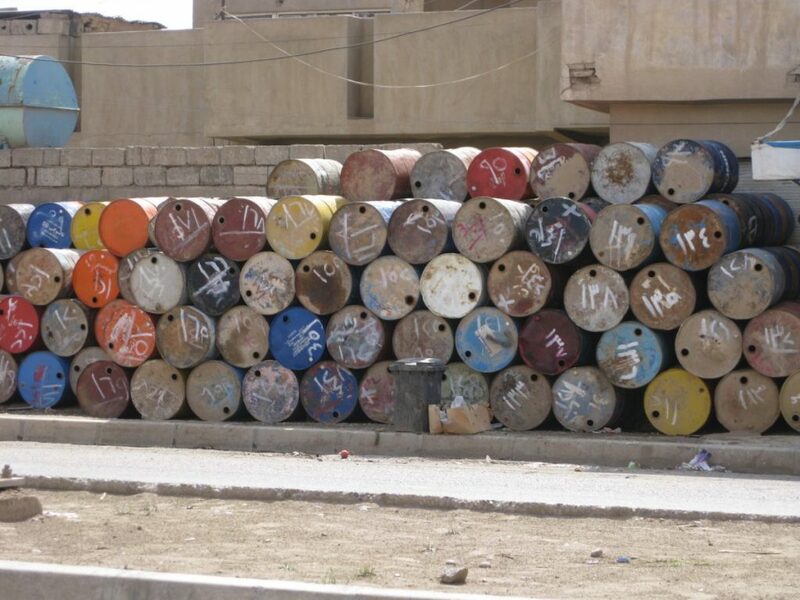 When Aneta Szylak, curator and founder of NOMUS New Art Museum, Gdansk, snapped barrels in Kurdish Iraq in 2008, it could almost have been an old Christo installation of rough barrels. But every barrel was painted smooth and bright when it was new. Christo makes the colour of his a crucial element in the work. In the London Mastaba’s vertical sides, he creates a dense, hypnotic pointilist colour field by making the barrel ends red, mauve or blue. The sculptural shapes he creates with them have changed too. 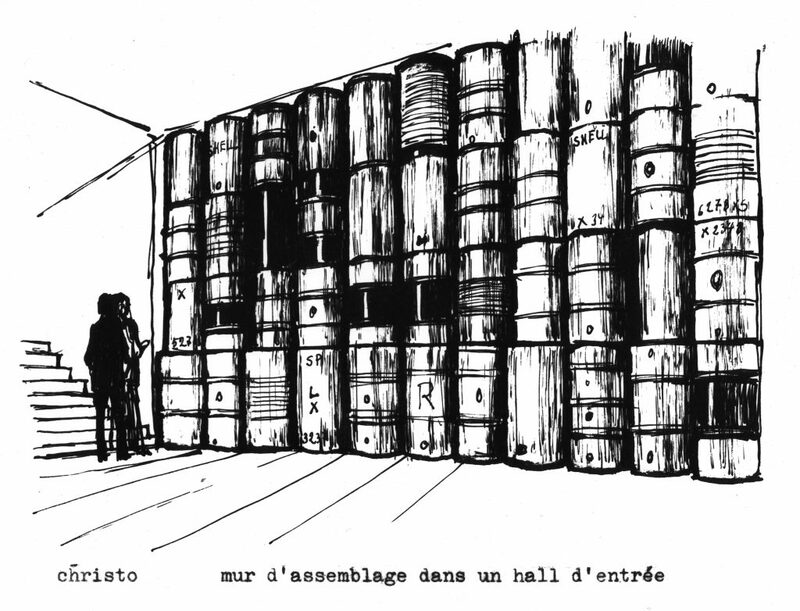 At first, there were columns made by simple stacking, but as early as 1962, the mastaba shape had started to emerge, just four layers high, in the drawing for Scéne du spectacle complet – déménagement de 2000 tonneaux métalliques. After he moved to New York in 1964, Jeanne-Claude had the know-how and front to negotiate the politics of authorities and property owners there to try to stage bigger ideas, later earning her joint credit as artist. In 1968 they proposed blocking off 53rd Street between 5th and 6th with a wall of barrels, as well as wrapping the MoMA building there and building a mastaba in its reception. The same year, a mastaba was proposed for Philadelphia‘s Institute of Contemporary Arts. But there were also variations from the mastaba form, such as the 1967 proposal for 303 barrels (project for Lake Michigan) which tapers to a triangular point. Christo is now very particular about his mastabas – the proportions must be in the ratios 2-3-4 and the angle of slope 60 degrees. What exactly is a mastaba? There’s an ambiguity in Christo’s use of the word, which normally refers to ancient Egyptian tombs which are flat-topped sloping structures, just like Christo’s. However, he has told Obrist that the Egyptian tomb ‘is not the meaning I am interested in’. Instead, he refers a stone or brick bench attached to a house, called a ‘mastaba’ in Arabic. These pre-date the Egyptians, originating in Mesopotamia perhaps six thousand years ago. No-one seems bothered that, unlike mastaba tombs, these benches may not have had the shape Christo uses. The Mastaba has been touted as Christo’s first work in London, but is it? In 1962, Christo had wrapped a woman in the Dusseldorf studio of photographer Charles Wilp, who would later make one of the 1960s’ most experimental films to promote Afri-Cola, and also had a London studio. In 1963, Christo and Wilp filmed Wrapped Woman there. The idea fits in neatly in a narrative of bagging human forms that runs from Magritte’s painting of wrapped heads The Lovers (1928), and includes Yoko Ono’s 1969 Bagism with John Lennon. But what is the greater artistic context of the barrels and mastabas? Christo had visited the studio of Alberto Giacometti, and there is a resonance with him in the textures and column forms of early barrel works. 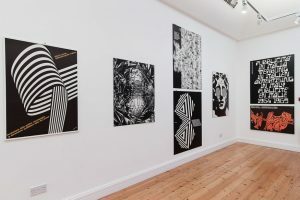 He also acknowledges Jean Dubuffet, and there is a shared counter-culture rejection of the prevailing norms of art, in Christo’s case with his unique media. It places Christo’s early works firmly with the Nouveau Réalisme movement, although at the time other Paris artists producing mash-ups incorporating real objects thought Christo’s work was over-arranged and not raw enough. 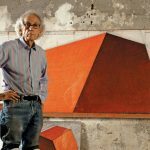 It was in 1960s New York that Christo fits more easily into the artistic landscape, first with its climate of conceptual art, and more literally with the emerging field of Land Art. Art historian Nada Nesheva notes how land artists were ‘challenging the experience of the gallery space’. For example, she cites Robert Smithson’s A Non-Site, 1968 sculptures that involved sand or stones in geometric boxes. They came with maps, but subsequently his projects go outside (as if into the maps) and intervene in the landscape. Christo, of course, always starts with drawings and models with the intent to realise the works out in the field. Another land artist notable for drawings is Michael Heizer, and Nesheva notes how the Mayan pyramid forms in his ongoing Nevada megaproject City which began in 1972 resonate with Christo’s mastaba form. But Christo’s transition from raw barrels to smooth, colourful painted ones leaves earthy Land Art aesthetics and pushes his work towards populist, poppy contemporary outdoor sculpture (although it never gets as brash as say Jeff Koons). 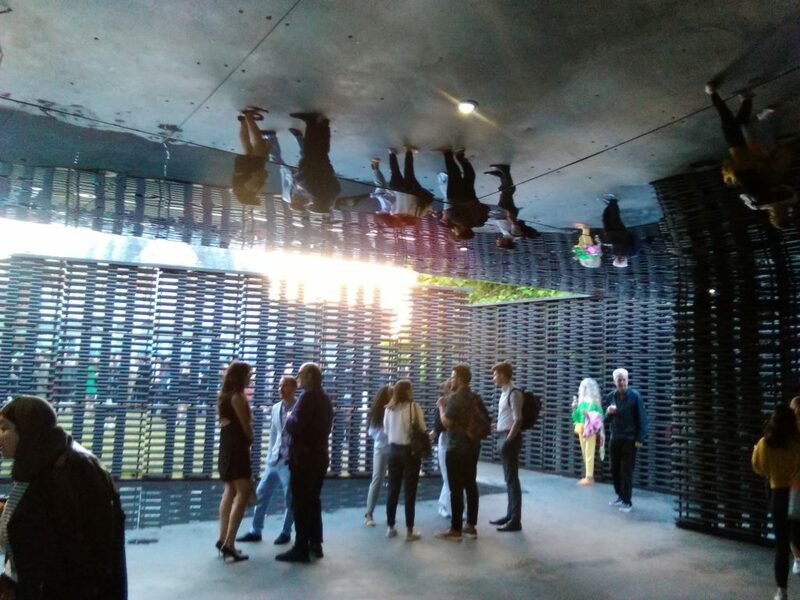 It’s interesting to compare the Mastaba with this year’s Serpentine Pavilion by Frida Escobedo – they are both architectural, but she has created a habitable structure with a lattice of dark grey tiles, the very opposite in terms of colour, texture and permeability to the Mastaba. 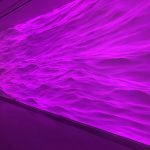 Contemporary art has splashed out into spectacle with scale to create a mass experience, but the pendulum may be swinging the other way, to quieter, more reflective experiences, such as Escobedo’s. That doesn’t dismiss the London Mastaba’s appeal. Its contrast with its setting is thrilling, its reaction to light and weather an ever-changing fascination, and there’s something dramatic about how it lurks in plain sight, as if ready to power up and scatter rowing boats and swans in its wake like a vast vessel, or even crash onto the shore. That won’t happen because it’s tethered to the Serpentine’s bed beneath the waters. 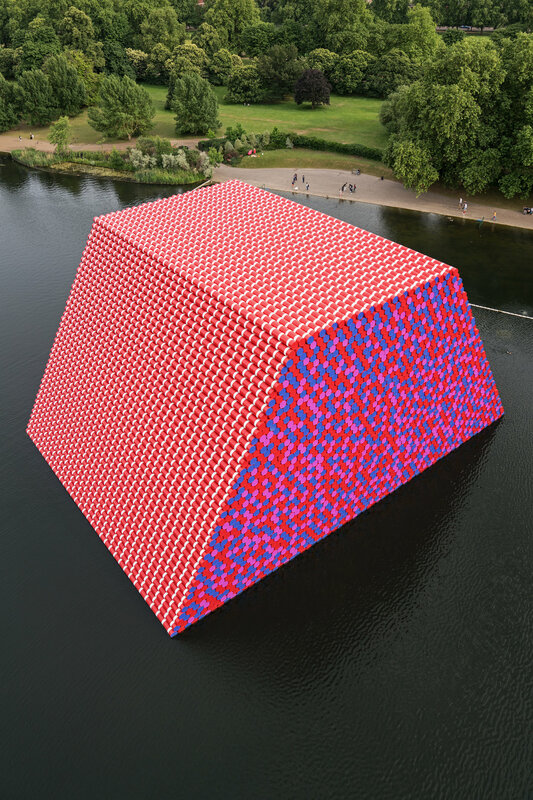 Christo’s works are tremendous drivers of art tourism — the London School of Economics estimates the Mastaba will generate £150m of economic activity for London. They are big, beautiful and unique. 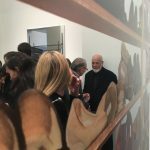 But perhaps they have become tethered to an instagram-friendly art culture that seems increasingly ephemeral. This entry was posted in Art Reviews. and tagged Christo, Serpentine Gallery. Bookmark the permalink.